Improve your website’s organic performance in search results with an SEO audit. Whether your site has been through major changes or a period of neglect, it can be hard to figure out just how to move forward. We take the guesswork out of SEO by sharing prioritized recommendations and deliverables you can implement immediately to improve your site’s performance. Hire us to perform an SEO audit for your website. An SEO audit is an inspection of a website with the intent of improving the site’s rankings in organic (free) search results. SEO audits can be performed with specialized tools and/or by an experienced SEO consultant. Organic traffic has declined to your website after a recent redesign, site migration, consolidation, rebrand or other major technical, content, or link-related event. Technical debt has accumulated on your website (both active and inactive technology). Many times, the plugins and other technology you use can end up getting in the way of each other, or worse yet, getting in the way of search engine bots, browsers, and users. Content is outdated can leave your site bloated and ranking for keywords that are no longer important or relevant to your customers. Content duplication is occurring and may be causing over indexation concerns or eroding page authority. This may lower the overall authority of your site and make it less likely that users will find your content in search engines. Blocked or hidden content may be causing under indexation concerns. Users are less likely to find your content in search engines if all of your content isn’t present in their index. Slower page load times leave visitors frustrated, signal search engines to assign your site a lower rank, and directly correlate to lower conversion rates. Website is not secure (https), which may risk your visitor’s privacy and can trigger warnings in their browser. Even for sites that are not transactional, offering a secure connection is becoming increasingly important, especially where competitor sites have already made the move to https. Poor mobile experiences can lead to unsatisfied visitors, a climbing bounce rate, and decreased keyword rankings based on Google’s understanding of low user satisfaction. Broken links that are outbound (links from your website to other websites), inbound (links from other websites to yours), or internal (links from one page of your site to another) may lower your site’s trust and authority. Not following Google’s Webmaster Guidelines may be resulting in a general devaluation of your site and leaving your content less visible to users in search results. How often should you get an SEO audit? Annual or bi-annual SEO audit of your website can range from beneficial to crucial, depending on your industry and/or content strategy. If two or more of the follow apply to you, we recommend that you consider conducting yearly SEO audits. Think of getting an SEO audit of your website like going to the doctor–you don’t have to go for an annual wellness checkup, but it’s advisable that you do. You will catch content and/or technical problems with your website sooner, making it easier to recover from a drop in search rankings or increase your organic traffic. How do you deliver the SEO audit? We meet with you every 1-2 weeks. Each subject matter expert on our team will evaluate your site and meet with you and anyone else who may need to be involved with that portion of the audit (for example, your developer(s), content editor(s), or designer). Google Search Console – Before we work with a client the first step is verifying their site with Google Search Console (and all domain variations) unless this is already in place in which case we will need access. Google Analytics – Access to our clients’ Google Analytics accounts is crucial to our SEO audit process. The data provided in Google Analytics allows us to set a track specific KPIs and measure the impact of the recommendations contained in the SEO audit deliverables. Bing Webmaster Tools – often overlooked, Bing Webmaster Tools provides some insights not contained in any of the Google tools. 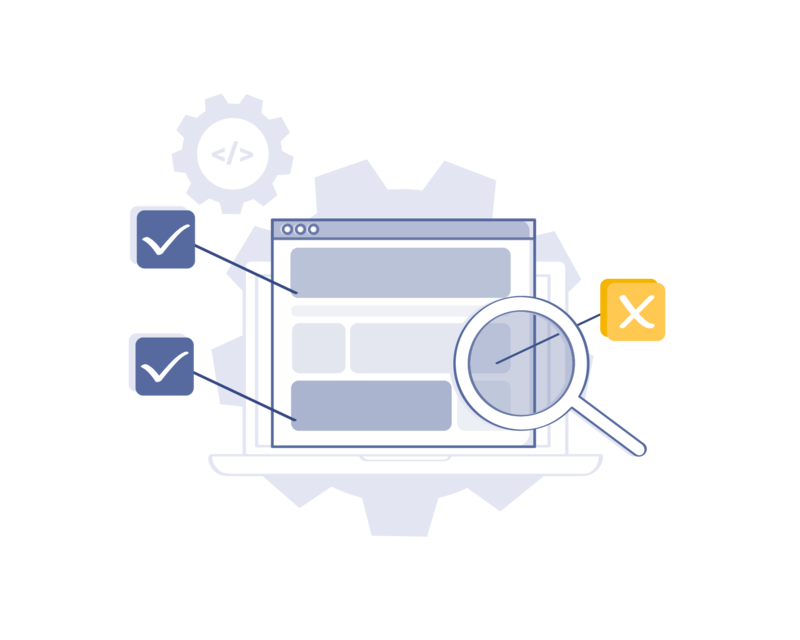 Chrome Developer Tools – When we want to see how crawlers and browsers interact with your site, we use Chrome Developer Tools. Understanding page speed and user experience issues is a crucial part of any SEO audit, and Chrome Developer Tools reveals which page elements are slowing users down. Paid tools for conducting an SEO audit are almost too numerous to count. Here’s a list of our favorites and how we use them. Because paid SEO audit tools can eat up your SEO budget, it’s important to consider their pros and cons in light of your current needs and resources. Tools are great for tracking performance and SEO issues across large sites and the data they provide can really help you set your priorities. But if you don’t have a robust in-house SEO team to take those priorities and run with them, the cost may not be worth the spend. Strategy comes from people, and good SEO strategy comes from experienced SEOs. Outspoken Media’s SEO audits combine the insights of the industry’s top tools with our team’s experience, perspective, and understanding of your unique situation and needs. The result is a strategy that moves you closer to your organic growth goals and delivers measurable results. Do you need to improve your website’s organic performance? Contact us to see how our SEO audit service can help.